Last month Branko Milanovic published a blog post about the Yellow Vest movement against the fuel tax in France. He was worried – like many analysts – that the uprising proves it will be virtually impossible to roll out the policies necessary to reduce carbon emissions. He’s convinced that people simply won’t accept it. Let’s deal with these issues one at a time. First, the Yellow Vests. Don’t get it twisted: the French began rioting not because of the fuel tax as such, but rather because it was extremely regressive. The burden of the tax fell disproportionately on rural and peri-urban workers who, already struggling to make ends meet under a government that is openly disdainful of working class people, were suddenly forced to pay more at the pump simply in order to get to their jobs. Meanwhile, the elites of Paris and other cities, who get to use public transportation, were less affected. The Yellow Vests felt this was unfair. And they are right. The Yellow Vests are not against environmental policy. In fact, they highlight ecology as a top priority, and have even called for stronger climate action, accusing Macron of fiddling around the edges with “piecemeal measures”. Real climate policy, they say, requires widespread economic changes, and should target the real drivers of climate change: rich consumers and, above all, corporations. I agree with them. There are many ways to make a carbon tax fair and progressive. One obvious step would be to tax carbon at source and distribute part of the yields back to working-class households in the form of a dividend or rebate. The effect would be to ensure that the costs of the energy transition are borne by the rich and by corporations, as it should be. So, my response to Branko: it’s not the gas tax that’s the problem. It’s inequality that’s the problem. Branko’s post indicates that he is aware of this dynamic… so one wonders why he is so confused about the way forward. It’s simple: reducing inequality needs to be at the very heart of climate policy. This brings me to the next point, about degrowth. It is increasingly apparent that Branko has read very little in the field of post-growth or ecological economics. There are literally hundreds of peer reviewed articles and books that explore exactly the questions he’s asking here - including this new economic model that investigates policies for a de-growth scenario in, of all places, France - and yet it seems Branko can’t be bothered to engage with them. Instead, he continues to misrepresent our scholarship. Literally no one has ever argued that we should just cut everyone’s income in half. That is a ridiculous assertion. Repeating this straw man over and over won’t somehow magically make it true. Post-growth policy begins with the very principle that – as the Yellow Vests themselves have pointed out – should inform all ecological policy: greater equality. Indeed, the post-growth movement has long argued that equality can be a substitute for growth. By sharing what we already have more fairly, we won’t need to plunder the Earth for more. 1. Abandon GDP as a measure of progress and either replace it with a more holistic alternative (like the Genuine Progress Indicator) or focus public policy on a series of social indicators to be improved (like well-being, health, good employment) and ecological footprint indicators to be reduced (like resource use, emissions, waste). 2. Scale down throughput by introducing progressive taxes on resource use, emissions and waste, or impose caps on these activities and tighten them each year. Require manufacturers to offer extended warranties on all material products in order to encourage longer lifespans. Legislate a “right to repair”, and introduce laws against planned obsolescence. Ban advertising in public spaces, as Sao Paulo and other cities have done. Prevent supermarkets from trashing food, as France and Italy have done, and impose fees on food waste while banning it from landfills, as South Korea has done. Etc. Reducing the material throughput of the economy not only takes pressure off ecosystems, it also reduces energy demand, which - as the recent IPCC report points out - makes the transition to renewable energy much more feasible. 3. Shorten the working week and distribute available work more equally in order to ensure full employment. Not only does a shorter working week have all sorts of positive ecological and social benefits, it also relieves pressures for growth. In the existing economy, as labour productivity improves people get laid off, and we have to generate more growth in order to create new jobs and mop up unemployment. Shortening the working week allows us to create jobs without the need for growth. It also ensures that if aggregate economic activity slows down (which it likely will as material throughput declines) then workers laid off from dying dirty industries can get jobs in cleaner ones, even as total labour requirements diminish. To offset reductions in working hours, either increase hourly wages with a living wage policy or (to avoid hurting small businesses) introduce a universal basic income, as per proposals by Andre Gorz. 4. Expand universal social goods and reinstate commons, to ensure that people can access the resources they need in order to live well without high levels of income. This means generous, high-quality public healthcare and education, rent controls, affordable public housing and transportation, and access to public parks and recreational facilities. It could also mean a system of universal basic services, as UCL’s Institute for Global Prosperity has proposed. Scaling down aggregate economic activity might reduce private riches, but - as I have argued before - it needn’t reduce public wealth. 5. Distribute national income more fairly by introducing either high marginal tax rates on top incomes (like the 80% top marginal tax rate the US averaged from 1943 to 1983), or a maximum wage policy. Roll out a wealth tax, as Thomas Piketty has proposed, and a financial transaction tax. Close down secrecy jurisdictions and introduce a global minimum corporate tax to wipe out tax evasion. Use the proceeds of these taxes, and of the above-mentioned fees on resource use, emissions and waste, to (a) help fund the rapid rollout of renewable energy infrastructure, (b) contribute to a universal basic income, and (c) invest in public goods. Democratise workplaces and encourage co-operative ownership structures for businesses. Branko says that I am “singularly coy and shy when it comes to pointing out who is going to bear the costs” of transitioning to an ecological economy. I have no idea where he gets this notion. On the contrary, I have always been clear that the transition requires justice as a core principle: that we create a fairer, more equitable society. A number of high-profile economists – people like Carlota Perez and Michael Liebreich – have recently come out swinging in favor of “green growth” theory, trying to assuage mounting public concerns about the fact that climate change and ecological breakdown are being driven by capitalist growth. What’s interesting about these interventions is that they explicitly pit themselves against their opposite – the idea of de-growth. Even just a year or two ago, de-growth wouldn’t have been part of the conversation. Once the province of ecological economists, it’s now gaining more mainstream attention as the evidence against growth mounts – and orthodox economists have no choice but to reckon with it. But as they try to edge their way around certain prickly facts, their arguments get stranger and stranger. Green growth theory relies on the assumption that GDP growth can be permanently and absolutely decoupled from resource use and emissions, and at a pace that’s fast enough to reverse ecological breakdown and keep us under 1.5 degrees, so that GDP can continue growing forever while environmental impacts decline. There’s just one problem. There’s no evidence that this is feasible. Let’s start with emissions. Fortunately, we know that GDP can be absolutely decoupled from emissions. The real question is whether we can decarbonize fast enough to stay under 1.5 degrees, without relying on fanciful negative emissions technologies. The answer, sadly, is no. If we carry on with growth as usual, we need to decarbonize at a rate of 11% per year. That’s more than five times faster than the historic rate of decarbonization and about three times faster than what scientists project is possible, even under highly optimistic conditions. But let’s imagine, just for the sake of argument, that we manage to pull it off: we manage to shut down the fossil fuel industry and switch the whole planet’s energy infrastructure over to renewables, quickly, despite continuous economic expansion. Does this solve our problem? Are we on track for green growth forever? Sadly not – because we still have another issue to deal with, namely, resource use. What are we going to do with all of our clean energy? The same stuff we were doing with fossil fuels: trawl the oceans for fish, raze forests for timber, strip mountains for minerals, clear land for cattle feed, etc. And we will do this more and more each year, because that’s what growth demands. This brings us to the next conundrum - even more difficult than the first. Can we continue to grow GDP indefinitely while reducing resource use down to sustainable levels? Well, existing data are not very promising: there is no historical evidence for this, and all extant model-based projections have found that permanent absolute decoupling of GDP from resource use cannot be accomplished even with rapid rates of technological innovation and strong government intervention (references here). But green growthers are not deterred. What if we shift to an economy based on services and knowledge, they ask? First of all, such a shift is already accounted for in the models. But we don’t need the models to answer this question. Services have grown dramatically in recent decades, as a proportion of world GDP - and yet during this same period global material use has not only continued to rise, but has accelerated, outstripping the rate of GDP growth. In other words, there has been a recoupling, a rematerialization, despite a shift to services. The same is true of high-income nations as a group – and this despite the increasing contribution that knowledge is said to make to GDP growth in these economies. Indeed, while high-income nations have the highest share of services and knowledge in terms of contribution to GDP, they also have the highest rates of resource consumption per capita. By far. Why is this? Partly because services require resource-intensive inputs (think universities and hospitals and airports and hotels). Partly also because the income acquired from the service sector is used to purchase resource-intensive consumer goods (you might get your income from YouTube videos, but you use it to buy TVs and cars and beef). And partly because our “knowledge” is geared primarily toward technological development – finding ways of increasing productivity and efficiency, which is then leveraged to expand production. Our existing trajectory toward knowledge and services isn’t yielding the results that green growthers predict. So why should the future be any different? The evidence piles up. And in the face of this evidence, proponents of green growth begin to turn to fairy tales. Sure, they say, maybe green growth isn’t empirically actual, but there’s no reason that it can’t happen in theory. We are limited only by our imagination! There’s no reason we can’t have our incomes rising forever while we nonetheless consume less and less material stuff each year. And here they are right. There’s no a priori reason why such a thing can’t happen in theory, in a magical alternative world. I would welcome such a turn - who wouldn’t? Of course, there’s a certain moral hazard at stake when we start trafficking in fairy tales – telling people not to worry because eventually, somehow, GDP will magically de-link from resource use and we’ll be in the clear. In an era of climate emergency and mass extinction, we don’t have time to speculate about imaginary possibilities. We don’t have time to wait for this juggernaut of ecological destruction to suddenly stop being destructive, when all the evidence says that it won’t happen. It is unscientific, and a profoundly irresponsible gamble with the future of our civilization. So here’s what we can do. Let’s not waste time speculating. Let’s impose a legal limit on annual resource use and waste – something that de-growthers have been demanding for a long time – and tighten that limit year-on-year until we are back down to planetary boundaries. This is a simple and elegant solution to the debate. If green growthers really believe that global GDP will keep growing, forever, despite rapid reductions in material use, then this shouldn’t worry them one bit. In fact, they should welcome such a move. It will give them a chance to prove to the world once and for all that they are right. Indeed, putting hard limits on resource use and waste will help incentivize the transition, spurring the shift toward dematerialized GDP growth. What’s not to love? There’s only one problem: every time we propose this policy to green growthers, they wriggle away. Indeed, to my knowledge, not a single proponent of green growth has ever agreed to take it up. Why not? I suspect that on some deep level - despite the fairy tales - they realize that this is not how capitalism actually works. For two hundred years, capitalism has depended on extraction from nature. It has always needed an “outside,” external to itself, from which it can plunder some kind of original value, for free, without an equivalent return. To put a limit on material extraction and waste is to effectively kill the goose that lays the golden eggs. Maybe green growthers will unite with us around limits to material use and waste. I hope so. But as long as they continue to refuse this simple solution, I don’t see how we can regard their fairy tales as anything other than a bluff. And it’s time to call it. I reject the fetishization of GDP as an objective in the existing economy, so it would make little sense for me to focus on GDP as the objective of a degrowth economy. Wanting to cut GDP is as senseless as wanting to grow it. The objective, rather, is to scale down the material throughput of the economy. From an ecological standpoint, that’s what matters. And indeed some orthodox economists might even agree. Where we differ is that while they persist in believing (against the evidence) that this can be done while continuing to grow GDP, I acknowledge that it is likely to result in a reduction of GDP, at least as we presently measure it. In other words, if we were to keep measuring the economy by GDP, that’s what we would see in a degrowth scenario. It’s okay, because we know that human beings can thrive without extremely high levels of GDP. There are many pieces to this argument, but I want to focus on one here in particular. One of the core claims of degrowth economics is that by restoring public services and expanding the commons, people will be able to access the goods that they need to live well without needing high levels of income. Take London, for instance. Housing prices in London are astronomically high, to the point where a normal one-bedroom flat can cost upwards of $1 million. These prices are fictional; largely a consequence of financial speculation and quantitative easing. Now imagine if the government were to cap the price of housing at half its present level. Prices would still be outrageously high, but Londoners would suddenly be able to work and earn significantly less than they presently do without suffering any loss to their quality of life. Indeed, they would gain in terms of time they could spend with their friends and family, doing things they love, improvements to their health and mental well-being, etc. The fictionally high prices of housing in London require that people work unnecessarily long hours to earn unnecessary money simply in order to access decent shelter – which they were previously able to access with a fraction of the income. The consequence of this imperative is that everyone is forced to contribute unnecessarily to expanding the juggernaut of production, the output of which must in turn find an outlet in the form of ever-increasing consumption. This is a problem that’s as old as capitalism itself. And it has a name: enclosure. 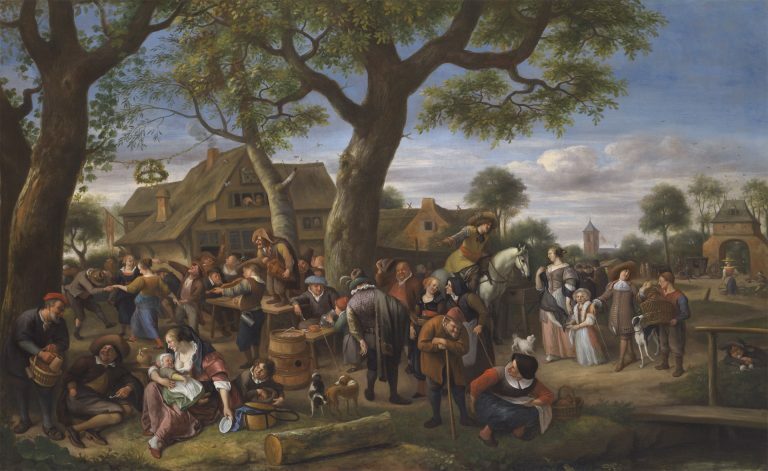 Ellen Wood argues that the origins of capitalism lay in the enclosure movement in England, during which wealthy elites walled off the commons and systematically forced peasants off the land in a violent, centuries-long campaign of dispossession. This period saw the abolition of the ancient “right to habitation”, once enshrined in the Charter of the Forest, which guaranteed that ordinary people should have access to the resources necessary for survival. Suddenly, England’s peasants found themselves subject to a new regime: in order to survive they had to compete with each other for leases on the newly privatized land. And the leases were allocated on the basis of productivity. So in order to retain their access to leases, farmers had to find ways to extract more and more from the earth, and from labour, even if it was vastly in surplus to need. If they didn’t, and if they lost their leases, they could face starvation. And of course this same force, the imperative of ever-increasing productivity, was at work also in the industrial sector. In other words, the birth of capitalism required the creation of scarcity. The constant creation of scarcity is the engine of the juggernaut. The same process unfolded around the world during European colonization. In South Africa, colonizers faced what they called “The Labour Question”: How do we get Africans to work in our mines and on our plantations for paltry wages? At the time, Africans were quite content with their subsistence lifestyles, where they had all the land and the water and the livestock they needed to thrive, and showed no inclination to do back-breaking work in European mines. The solution? Force them off their land, or make them pay taxes in European currency, which can only be acquired in exchange for labour. And if they don’t pay, punish them. Scarcity is the engine of capitalist expansion. And, crucially, the scarcity was artificially created. Created by elite accumulation, backed up by state violence. In both England and South Africa, there was no actual scarcity. 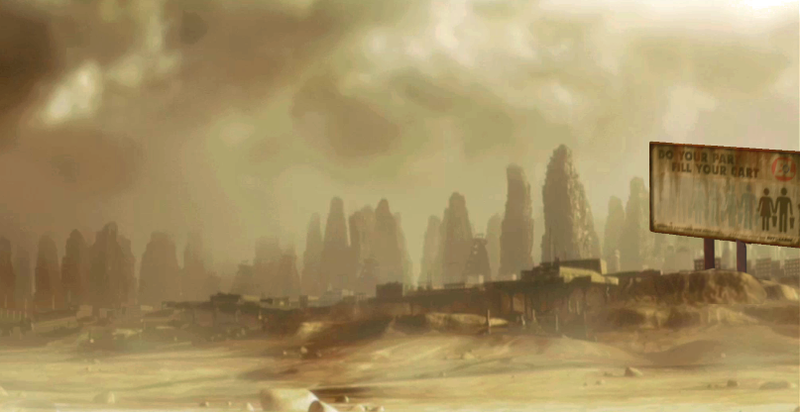 The same land and forests and resources remained, just as they had always been. But they were locked up. Enclosed. In order to regain access to the means of survival, people had no choice but to participate in the juggernaut. Today, we feel the force of scarcity in the constant threat of unemployment. We must be ever-more productive at work or else lose our jobs to someone who will be more productive than we are. But there is a paradox: as productivity rises, less labour is needed. So workers get laid off and find themselves with no means of survival. Victims of artificial scarcity. And the state, desperate to reduce unemployment, must then find ways to grow the economy in order to create new jobs, just so that people can survive. And all of us workers join in the choir: Give us growth! We need jobs! Scarcity creates recruits to the ideology of growth. Even people who are concerned about ecological breakdown, which is most of us, are forced to submit to this logic: if you care about human lives, then you must call for growth. We can deal with the environment later. But there will be no later, because the problem of scarcity is never solved. Whenever scarcity is about to be solved, it is always quickly produced anew. Think about it: for 150 years, economists have predicted that “In the very near future our economy will be so productive and replete that we will all have to work no more than a few hours a day.” But the prediction never comes true. Because capitalism transforms even the most spectacular productivity gains not into abundance and human freedom, but into scarcity. It’s strange, isn’t it? The ideology of capitalism is that it is a system that generates immense abundance (so much stuff!). But in reality it is a system that relies on the constant production of scarcity. This conundrum was first noticed back in 1804, and became known as the Lauderdale Paradox. Lauderdale pointed out that the only way to increase “private riches” (basically, GDP) was to reduce what he called “public wealth”, or the commons. To enclose things that were once free so that people have to pay in order to access them. To illustrate, he noted that colonialists would often even burn down trees that produced nuts and fruits so that local inhabitants wouldn’t be able to live off of the natural abundance of the earth, but would be forced to work for wages in order to feed themselves. We see this happening today in the endless waves of privatization that have been unleashed all over the world. Education? Healthcare? Parks? Swimming pools? Social Security? Water? All social goods must be privatized – they must be made scarce. People must be made to pay in order to access them. And in order to pay, they will of course have to work, competing with each other in the labour market to be ever-more productive. This logic reaches its apogee in the contemporary vision of austerity. What is austerity, really? It is a desperate attempt to re-start the engines of growth by slashing public investment in social goods and social protections, chopping away at what remains of the commons so that people are cast once again at the mercy of starvation, forced to increase their productivity if they want to survive. The point of austerity is to create scarcity. Suffering - indeed, poverty - must be induced for the sake of more growth. It doesn’t have to be this way. We can call a halt to the madness – throw a wrench in the juggernaut. By de-enclosing social goods and restoring the commons, we can ensure that people are able to access the things that they need to live a good life without having to generate piles of income in order to do so, and without feeding the never-ending growth machine. “Private riches” may shrink, as Lauderdale pointed out, but public wealth will increase. In this sense, degrowth is the very opposite of austerity. While austerity calls for scarcity in order to generate growth, degrowth calls for abundance in order to render growth unnecessary. Degrowth, at its core, is a demand for radical abundance. If you haven’t come across the Global Footprint Network yet, check them out. Based in Oakland, CA, they produce fantastic data on the Ecological Footprint (EF) of nations around the world. EF is measured in units known as “global hectares” – an omnibus measure that includes resource use, waste and emissions. The researchers at the Global Footprint Network calculate that our planet presently has enough biocapacity for each of us to consume about 1.8 global hectares per year. Anything over this means a degree of resource consumption that the Earth cannot replenish, or waste that it cannot absorb, and contributes to ecological breakdown. 1.8 global hectares is roughly what the average person in Ghana or Guatemala consumes. By contrast, Europeans consume 4.7 global hectares, while in the US and Canada the average person consumes about 8 – many times their fair share. This data raises an important question. What is the relationship between consumption (as measured by Ecological Footprint) and development? Of course, we know that EF is tightly coupled to GDP. But what about human development indicators? What about well-being? Is it possible for a nation to live within the threshold for biocapacity while at the same time having high standards of living? Ghana and Guatemala are hardly exemplary in terms of their social indicators... are there better models out there? The researchers at GFN have answered these questions with a fascinating chart that plots the Ecological Footprint of nations against their score in the Human Development Index (HDI). The results are striking. They show that as HDI rises, so too does EF. The two seem to be quite tightly coupled, such that achieving the higher levels of HDI generally means vastly outstripping biocapacity. There are a few outliers: countries that achieve "high" HDI (above 0.7) while nonetheless remaining within biocapacity. But all of the nations that achieve “very high” HDI (0.8) outstrip the biocapacity limit. Depressingly, there are no nations that fit within the box for sustainable development at very high HDI, although one country – Cuba, represented in grey – comes very close. This seems like a sensible approach, on the face of it. And the goal, of course, is for each nation to become more efficient at converting ecological footprint into human well-being, finding ways to enhance human flourishing with minimal pressure on the planet. But if that’s the objective, there are problems with using HDI. HDI is calculated as the average of three different indicators: life expectancy index, education index, and income (where 1 = GNI per capita of $75,000, on a logarithmic scale). Of course, it makes perfect sense to compare life expectancy and education against EF. But it does not make sense to compare income against EF. The reason is because income, like GDP, is inextricably linked to EF. While it is possible to achieve enormous gains in life expectancy and education with relatively little EF, it is not possible to grow average income up to $75,000 without vastly outstripping biocapacity. Sure, we can achieve some relative decoupling of GNI from EF (with rapid technological innovation and aggressive taxes on carbon and resource extraction) but not absolute decoupling. Income cannot go up to $75,000 while EF goes down to 1.8. It is a physical impossibility. So the HDI approach is self-defeating. As long as income counts as 33% of HDI, achieving very high HDI by definition requires growth to the point of outstripping biocapacity. If all nations in the world were to pursue the highest HDI (which is of course presently the plan), we would “develop” ourselves into ecological collapse. We need a better measure, one better suited for the Anthropocene. As I see it, the income component of HDI is underjustified. Average income does not tell us very much about well-being. There are a number of countries with relatively low income that nonetheless have high levels of human well-being. Costa Rica, for example, has a higher life expectancy than the US and happiness indicators that rival those of Scandinavian nations. But its average income is only $11,000, less than one-fifth that of the US. 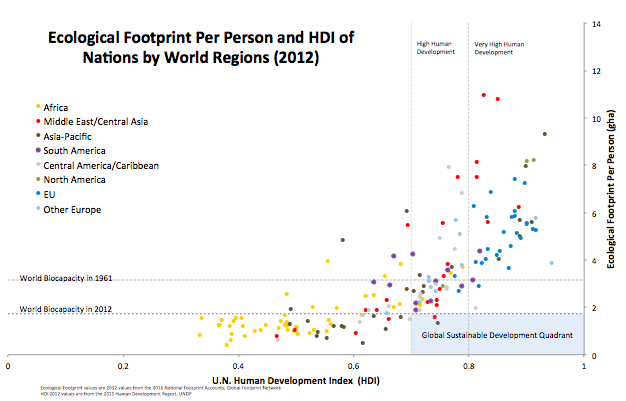 If you take income out of HDI, then Costa Rica qualifies as having “very high” human development. And its EF (2.8) fits well under the biocapacity line of 1961. Many other countries are also in the very high category with even lower EF, including Serbia, Romania, Albania. Cuba qualifies as very high, with an EF of only 1.95, extremely close to today’s biocapacity limit. And Georgia qualifies as very high with an EF of only 1.58. The problem with HDI is that it is an unreformed indicator; it still has a strong element of the old GDP-focused development mindset in it, and so is not fit for purpose when it comes to pursuing truly sustainable development. Indeed, some middle-income nations – like the ones listed above – excel at human development and yet are punished in the HDI rankings for having lower income. Why punish them thus? Shouldn’t we instead look at them as models to emulate, and build on, as we try to reverse ecological breakdown? Of course, income may contribute to well-being in ways that health and education indicators cannot capture. But there may be other indicators that we could include to get at this, such as happiness or life satisfaction. Or, alternatively, we could put a “cap” on the income component so that anything above, say, $15,000 counts as 1, rather than requiring nations to grow to excess in order to achieve that standing. Because HDI is lashed to income, it works against the possibility of a shift toward a post-growth economy. Consider this thought experiment. Let us say that rich nations choose to follow post-growth and de-growth principles, slowing down ecologically harmful and socially unnecessary economic activity (fracking, advertising, McMansion building, SUV production, beef farming, single-use plastics, food waste, planned obsolescence and so on) in order to reduce their ecological footprint. At the same time, they introduce pro-human policies: increasing the minimum wage and improving labour laws so that workers claim a bigger share of total income, socializing healthcare and education, controlling house prices by regulating speculation, shortening the working week and introducing a job guarantee. In such a scenario, average income would go down, but there would theoretically be no drop in quality of life – indeed, quality of life might even improve. People would likely be happier because they would have to work less, freeing them to spend more time with their loved ones and to engage in useful and creative pursuits. Assuming health and education indicators stayed the same (in reality they would probably improve), HDI would fall – but this would not be an accurate indicator of what is really going on. Indeed, it would obscure the most important part of the story. HDI was invented in 1990 as an antidote to the GDP-based conception of development. It was considered progressive for its time, but it is clear now that it did not go quite far enough. Nearly 30 years on, it’s time for a better measure – one that will aid rather than hinder us in our efforts to build a more ecological model of development. I recently wrote a post criticizing ecomodernism as “magical thinking”. I argued that it ignores key scientific studies on the unviability of absolute decoupling in order to advance an ecologically reckless insistence on growth. Not surprisingly, ecomodernists were not particularly happy about this. Linus Blomqvist of the Breakthrough Institute posted a rebuttal. It’s worth reading, because it gives a useful indication of the arguments that ecomodernists fall back on when challenged, and presents an opportunity to stress-test them. This is an important process. And the results are revealing. Blomqvist does not dispute the fact that absolute decoupling of material use from GDP is impossible on a global scale. He simply chooses to ignore this fact in favor of pointing to specific dimensions of resource use that he says are more hopeful. Here he relies on a single example: that “land use by agriculture… has been in slight decline since the mid-1990s, even as consumption of crops and meat has increased by 60%.” This is good news, he says, because it shows that absolute decoupling is possible after all. Blomqvist says that he draws this conclusion from FAO data. But unfortunately the FAO’s data don’t in fact jive with his story. Since 1990 total land use (for cropland and grazing) has grown from 4.79 billion hectares to 4.87 billion hectares. True, during the first decade of the 21st century agricultural land use held basically steady, but it’s been rising again since 2010, having increased by 50 million hectares – roughly the size of Spain. So this is not in fact an example of absolute decoupling, and it is frankly irresponsible for Blomqvist to invoke it as such. Relative decoupling, yes. But that’s not good enough. Even if land use did represent a story of absolute decoupling, we can't so easily claim, as Blomqvist does, that decoupling of this one impact means we can achieve decoupling across all key impacts. Indeed, isolating “good news” stories risks violating the basic principle of ecology – namely, that everything is connected. Land use is a good case in point. We have been able to increase agricultural yields by pumping the land full of industrial chemicals. But at what cost? We are dramatically overshooting the planetary boundaries for phosphorous loading and nitrogen loading, with all sorts of devastating consequences: (a) insect populations are collapsing, including pollinators, and birds are going down with them; (b) coastal waters are scarred by enormous “dead zones” from chemical runoff, which have quadrupled in size since 1950; (c) soil depletion has reached crisis levels, with scientists warning that on our present trajectory topsoils will only support another 60 years of harvests; and (d) dying soils are emitting immense plumes of greenhouse gas emissions, contributing substantially to global warming. These are not minor problems. They are existential threats, widely recognized as such by the scientific community. But Blomqvist dismisses this evidence as “vague appeals to ecological connectedness”. Because, as we’re beginning to learn, in Ecomodernist Land evidence doesn’t really matter very much if it gets in the way of growth. Now, here’s where it gets interesting. Blomqvist agrees that the objective should be to reduce agricultural land use. He agrees that this is ecologically important. But he thinks that the best way to do this is to continue to intensify our extraction from the land so that we can keep growing the industrial agricultural sector – exponentially, forever. Because whatever else, the mantra of growth must not be questioned. It is the sacred shibboleth. There’s a much easier and more sensible way to reduce agricultural land use: waste less food, and distribute food more fairly. We already produce enough food for 10 billion people, but a disproportionate amount of the world’s food ends up flowing to rich countries, where much of it ends up as waste. In the US and Europe, consumers bin up to half the food they purchase. The UN finds that cutting global food waste by only a quarter and redirecting it to where it is needed most would eradicate global hunger in a single stroke. (For citations see The Divide, where I develop this argument more fully). This would allow us to simultaneously improve human well-being, making people healthier and happier and more food-secure, while at the same time reducing land use as well as reducing chemical loading. But it would also mean that the industrial agricultural sector would shrink. It would de-grow. Is Blomqvist against this idea? Against eliminating food waste and redistributing food more fairly? I’d love to hear his answer. Because really this is what it all comes down to. Indeed, this is precisely the purpose of de-growth: to scale down ecologically destructive output that is not necessary for human well-being. Now, to Blomqvist’s next point. He writes “There is substantial reason to doubt that reducing GDP growth in the developed world will have the environmental benefit that Hickel seemingly believes it must, given that it is in developed countries that the promising decoupling trends have emerged.” This is a favorite line of the ecomodernists. The argument, when you state it plainly, is that growth is the solution to ecological collapse. We need more growth – more production and more consumption, exponentially, forever – so that we can become technologically advanced enough to decouple growth from environmental impact. The circular reasoning here is truly astounding. Remember, in my last post I challenged Blomqvist to explain why he thinks that endless exponential growth in rich nations is a desirable objective, given that it does nothing to improve social indicators or human well-being. His answer, bizarrely, is that it is ecologically necessary. Now, if there was even a shred of evidence that absolute decoupling was possible across all key impacts, and at sufficiently rapid rates to reverse ecological collapse, we might have a conversation. But there is not. Here again, Blomqvist’s position is reckless and unscientific. There’s just no other way to put it. Blomqvist suggests that rich nations need to continue growing, not because it improves human lives, but because it is the only way to achieve decoupling. This is a remarkable turn of logic. What’s happened here is that decoupling itself has become the goal. The ecomodernists, having failed to offer compelling reasons for why growth is socially necessary, have turned their sticking point into their sole raison d’etre. It’s like saying that we need to chop down more trees each year on an exponential curve, not because we need the wood, but simply so that we can learn how to chop down trees more efficiently. But this is where things get really odd. Blomqvist says “There is substantial reason to doubt that reducing GDP growth in the developed world will have environmental benefit.” Really? Is this really the ecomodernist argument? Is Blomqvist seriously proposing that there would be zero ecological benefits if rich nations consumed less? The suggestion boggles the mind. If GDP is tightly coupled to material use, and material use is tightly coupled to ecological impact, then if GDP goes down then ecological impact goes down. If rich nations were to consume fewer SUVs, fewer McMansions, fewer single-use plastics, fewer commercial flights, and less beef – as de-growth proposals suggest – their GDP would go down. Blomqvist offers not a shred of evidence that this would somehow magically not reduce ecological impact. And then of course there is the strawman. Blomqvist accuses me of wanting to de-grow developing countries – “a problematic political and ethical proposition, given how much these countries would benefit from higher incomes, better infrastructure, more employment”. But I have never once called for de-growth in developing countries, so this is a non-argument. It is not poor people who are the problem when it comes to ecological collapse. It is rich people. People in low-income nations consume only 2 tonnes of material stuff per person per year – way under the planetary boundary (7 tonnes). People in rich nations, by contrast, consume a staggering 28 tonnes per person per year. So Blomqvist is concerned about poverty in developing countries. Good – me too. And that’s precisely why we should care about overconsumption in rich countries. After all, we know that the ecological impact of the latter is disproportionately inflicted on the developing world. Developing countries are responsible for only 30% of historical greenhouse gas emissions, and yet bear 82% of the costs of climate-change (nearly $571 billion in 2010), and suffer 98% of climate-change related deaths (400,000 in 2010). Even the World Bank is now warning that climate change is on track to cause mass famine and human displacement across the South, this century, sending global hunger and poverty rates up (once again, full citations are available in The Divide). Here’s the real “problematic political and ethical proposition”: to assume that it’s okay for rich nations to continue growing needlessly while knowing that this is actively destroying the lives of poor people across the South. If we want to be serious about eradicating poverty in poor nations, de-growth in rich nations is going to have to be part of the equation. I recently wrote an article for Fast Company explaining why “green growth” is not a thing. I looked at three high-profile studies showing that even aggressive taxes and rapid improvements in technological efficiency will not be enough to cut global resource use as long as we keep growing the world economy. Right now we are consuming about 85 billion tons of material stuff per year, exceeding the sustainable threshold by 70%. According to the UN, our resource use will rise to at least 132 billion tons per year by 2050, and possibly as high as 180 billion tons. It is on this basis that scientists have concluded that absolute decoupling of GDP from aggregate resource use is not possible. But the ecomodernists at the Breakthrough Institute aren’t convinced. Linus Blomqvist wrote a blog post responding to my article, arguing that focusing on aggregate material flows is “misleading”, and that in reality absolute decoupling “is still a very real possibility.” The stakes are high. After all, decoupling is the central objective of ecomodernism. No decoupling, no ecomodernism. Blomqvist seems to agree that absolute decoupling of GDP from aggregate material use is not possible; or at least he doesn’t dispute the point. But we needn’t worry about this fact, he says; it doesn’t matter if we keep using more and more resources each year, because aggregate material use is not a meaningful proxy for environmental impact. Industrial and construction materials, for instance, “account for a pretty small portion of environmental impacts like greenhouse gas emissions or land use,” and while biomass use keeps growing, land use has peaked (at least for now). But this is cherrypicking indicators. Industrial and construction materials may contribute relatively little to greenhouse gas emissions and land use, but anyone who has ever seen (or lived next to) an open pit mine will know that they are ecological disaster zones in all sorts of other ways. Plus, Blomqvist’s claim about emissions and land just isn’t true (and he provides no evidence for it): the production of cement, iron and steel alone contributes 10% of anthropogenic CO2, and the use of the end products is clearly linked to fossil fuel consumption. As for biomass: let’s not pretend that land use is all that matters here. Our current method for extracting higher yields from land involves aggressive use of chemical fertilizers and pesticides, which have already pushed us well over the planetary boundaries for biogeochemical flows. And those same chemicals are causing insect populations – including pollinators – to collapse, and bird populations along with them. Indeed, the inputs involved in industrial agriculture are a major driver of biodiversity loss, regardless of whether or not more land is being used. And they drive soil depletion too, which in turn drives carbon emissions from the land. This is the thing about ecology, you see: everything is connected. The biomass bone is connected to the biogeochemical bone is connected to the insect bone. And that’s why aggregate material flows are in fact an important indicator of what’s happening to our planet. Sure, some material use has more dramatic impact than others. But no material use is impact-free. You can’t keep increasing aggregate material extraction and consumption indefinitely without increasing environmental impact right along with it. To believe that doubling or tripling our existing aggregate resource draw isn’t going to cause problems is magical thinking. Blomqvist’s next move is similar to the first. He says that while absolute decoupling of aggregate resource use may not be possible (and sadly even relative decoupling of emissions has come to a halt), there are some happy isolated cases where it does seem to be happening. Water extraction has peaked in the US, for example. And several pollutants (like sulfur dioxide and nitrous oxide) have peaked or declined globally. Blomqvist says this counts as “significant progress”. If this is the best the ecomodernists have to offer, I despair. First of all, you can’t look at nations (and particularly rich nations like the US) in isolation, because they have outsourced much of their environmental impact abroad. If you count all the water extraction involved in producing and shipping the imports that the US consumes, American water use is going up, not down. As for sulfur dioxide and nitrous oxide – yes, there have been gains, and we should celebrate them. But pollutants like these constitute one of the few examples where the much-misunderstood Environmental Kuznets Curve actually works. Ecologists have pointed out for years that the EKC doesn’t hold for most other impacts. So as a defense for endless growth, I’m afraid Blomqvist’s example just won’t do. I agree with Blomqvist that we should strive to accelerate resource efficiency. Of course we should! We need all the efficiency gains we can get. But unfortunately it’s not going to be enough, in and of itself – and we need to face up to this fact. Tellingly, Blomqvist doesn’t engage with my claim about the rebound effect, nor about the physical limits to efficiency gains (the paper I cite by Ward et al concludes that “permanent decoupling is impossible for essential, non-substitutable resources because the efficiency gains are ultimately governed by physical limits”). We can’t just ignore these realities. If absolute decoupling isn’t a thing, then ultimately we’re going to have to scale down global economic activity. Blomqvist doesn’t actually explain why he dislikes this conclusion so much. All he says is that degrowth “seems far-fetched”. I have no idea what he means by this. But could it really be more far-fetched than achieving what is physically impossible? Perhaps Blomqvist – or anyone at the Breakthrough Institute – could explain why they think that rich, high-consuming nations (like the US, for instance) need to keep growing their GDP (forever? ), when we know that additional growth is not generating any better social outcomes. Given how powerful the scale effect of growth is when it comes to driving ecological breakdown, it just doesn't make sense to take it off the table. Martin Ravallion, a former World Bank economist, recently wrote a blog post attacking my views on de-growth as “fallacious”. Since his post seems to be offered in good faith, I thought I would take a few minutes to respond. I admire Ravallion’s work. He’s an impressive scholar. But I’m afraid his argument about de-growth is a bit muddled. Let me see if I can clarify things, in the spirit of mutual learning. Ravallion questions a central tenet of de-growth theory, namely, that the ecology-busting levels of income and consumption characteristic of rich nations are not necessary in order to maintain their strong social outcomes. We can say this because there are a number of countries that are able to achieve equally strong social outcomes with vastly less income and consumption. Costa Rica is one of them. With a life expectancy of 79.1 years and levels of wellbeing in the top 7% of the world, Costa Rica matches many Scandinavian nations in these areas and far outperforms the United States. And it manages all of this with a GDP per capita of only $11,000, one fifth that of the US. In this sense, Costa Rica is one of the most efficient economies on Earth: it produces high standards of living with low GDP and minimal pressure on the environment. How do they do it? Professors Martínez-Franzoni and Sánchez-Ancochea argue that it has to do with Costa Rica’s longstanding commitment to strong social policy, which guarantees everyone equal access to generous, high-quality healthcare, education and social security, regardless of income. Examples like Costa Rica are important. We know that if we want to avert climate catastrophe, rich nations are going to have to scale down their bloated economies to get back in sync with the planet’s ecology. The science on this is clear. Fortunately, Costa Rica proves that this needn’t entail immizeration; it simply requires that we share our resources more fairly, and find ways to efficiently convert those resources into human flourishing. We can do it; we know it's possible. And this is good news. Ravallion’s attack is leveled against a straw man. Of course higher average incomes play a role in achieving better social outcomes! That’s why Costa Rica does better than, say, my home country of Swaziland, which has a per capita income of only $3,000. Regardless of how much Swaziland invests its meager resources in social policy, it probably won’t be able to match Costa Rica’s outcomes. My argument is not that social outcomes have nothing to do with income (indeed, no de-growther has ever claimed such a thing!). My argument is that high social outcomes can be achieved with relatively modest income – and certainly much less than rich nations currently command. Once again, Ravallion misses my argument. Of course growth is part of Costa Rica’s story! Strong, state-led development policies brought Costa Rica’s income from less than $3,000 in 1960 to $5,000 in 1980. And with that very modest level of income they built up strong social policy and raised their life expectancy from just 61 years (way behind the US) all the way up to 71, nearly matching that of the richest nations in the world at the time. Herein lies Ravallion’s mistake. Degrowthers have never argued that poor countries don’t need to grow. Growth may indeed be necessary for very poor countries (like Swaziland) to generate the resources necessary to build social policy and achieve strong social outcomes. But this does not require endless growth; it requires sufficient growth – in other words, growth up to a point of sufficient income. It's not growth as such that matters, but sufficiency. Ravallion confuses the two. During the 1980s, the US leveraged the Third World debt crisis to destroy state-led development programs and social policy all across the global South through structural adjustment programs imposed by the IMF and World Bank. Incomes collapsed virtually everywhere as a result. In Costa Rica, GDP per capita plunged from 1980 to 1983, and didn’t recover until 1991, more than a decade later. Yet during that decade, Costa Rica’s life expectancy continued to rise at a world-leading rate, from 71 years to 76, catching up to and surpassing the United States with a GDP per capita that was one-seventh the size, and stagnant. If growth as such is necessary to improve social outcomes – as Ravallion claims – how did Costa Rica manage this miracle? Presumably not by magic. No, it was because Costa Rica – thanks to savvy political maneuvering – was able to defy the Washington Consensus and keep its social policy system intact. It was one of the only countries in the South that managed to do so: a rare beacon amid the wreckage of structural adjustment. Of course, Costa Rica is not a de-growth economy. We point to Costa Rica not as an example of de-growth, but as an example of what can be achieved with relatively modest levels of mean income. That's an important distinction. But all of this is really beside the point. Again, we de-growthers do not target our critique at poor countries. We target rich countries. We argue that rich countries have grown too much, and that they could maintain or even improve their social indicators with vastly fewer resources than they presently consume. Ravallion insists that this is a fallacy: "The fact that some countries have better social outcomes at a given level of mean income does not imply that richer countries can attain the same social outcomes at lower mean income," he writes. But why not? Unfortunately he doesn't explain. Meanwhile, Europe achieves better social indicators than the US with 40% less income. And we know that the US in the 1970s had better wages, higher levels of happiness, and lower poverty than it does today, with roughly half the real GDP per capita. Ravallion's response? "One must seriously doubt that halving today’s average income in the US will restore the social outcomes of 50 years ago.” But this is another straw man. Literally nobody has ever argued that cutting the average income of rich nations would automatically produce better social outcomes. That Ravallion makes this strange assertion leads me to worry that he is not serious about engaging with the literature on de-growth and ecological economics. If he was, he would find that we carefully and studiously think through the policies that would be necessary in order to maintain and improve social outcomes while scaling down economic activity. We do not, as Ravallion claimed in a tweet, blindly “hope that economic contraction comes with pro-poor redistribution”. Take Peter Victor’s work, for example. In Managing Without Growth, Victor runs a standard economic model that shows that if you stop or reduce GDP growth, then poverty and unemployment suddenly shoot up. That’s obviously bad. It happens because our economies are structurally dependent on growth. But they needn't be. Victor shows that if we introduce new policies into the model, like new measures of economic progress; a carbon price; more generous social policies; limits on material, energy, waste and land use; a shorter working week; etc., then you can actually reduce poverty and unemployment in a zero-growth scenario. Strangely, for a man who has devoted much of his career to thinking about how to achieve human flourishing, Ravallion seems uninterested in such research. Instead, he says (in another tweet), let’s stick with growth and “try harder on the environmental policies”. Yes, we need to get the environmental policies right. But unfortunately this, in and of itself, is not going to be enough. Schandl et al (2016) show that even if we (a) impose a carbon price of $50 per ton, rising by an extraordinary 4% per year to $250 per ton, and (b) somehow miraculously manage to double the material efficiency of our economies more or less immediately, rich nations will still only be able to achieve decarbonization of max 4.7% per year. But this doesn’t get us anywhere near the emissions reductions we need to keep from blowing the 2C carbon budget (viz, 10-12% per year). Plus, with a background growth rate of 2%, nearly half of that decarbonization will be wiped out. Schandl et al also find that the same best-case scenario achieves no absolute reduction in material footprint in the long term. There’s no way around it. Averting climate catastrophe and ecological collapse is going to require that rich countries right-size their economies. Our task now is to figure out how to make that happen in a way that enhances - rather than erodes - human flourishing. This is the single biggest challenge of the 21st century, and I hope that Ravallion will join us in rising to it. Branko Milanovic has written a response to my argument. As I read it, I was struck by two things – both quite significant. First, Branko now seems to accept the science on how “green growth” is not a thing, and has backed off his assumption that endless growth is (a) possible, and (b) something we should promote. Or at least he has chosen not to defend his earlier claims on this matter. This is quite a shift. Second, Branko does not insist that growth is necessary in rich nations. In fact, he seems to agree that we can maintain well-being in rich nations while reducing material consumption. And he accepts the notion that we can accomplish this by shifting to a different kind of economy, along the lines of my suggestions. “I do not think that this program is illogical,” he says. So far, then, we’re on the same page. But Branko doubles down on one bit of his earlier argument: that degrowth is not politically feasible. “It is just so enormous, outside of anything that we normally can expect to implement, that it verges, I am afraid, on absurdity,” he writes. He claims that people are so penetrated by the ideology of competitive consumerism that they would never voluntarily walk away from the system. So it will be impossible to put degrowth into practice in a democracy. I do not disagree with Branko that the task is enormous; I have complete empathy with this perspective. Indeed, it is the single greatest problem of our century – how to enable human flourishing while reducing emissions and material throughput – and it demands our total focus. But let me offer three thoughts that give me hope. 1. People are not just consumption bots. Branko advances a dystopic vision of people who identify totally with the extrinsic values of competitive consumerism and growth. First, it’s just not true. People over-consume not because it aligns with their inner values, but because they feel compelled to do so, and because our economy is structured so as to incentivize it. The system requires endlessly growing consumption, and so externalizes true costs and bombards us with messages and ads to provoke consumptive behavior, seeding us with discontent and anxiety that is particularly acute in conditions of high inequality. It will be difficult to overcome these forces, to be sure. We need to change the messages, change the incentives, internalize costs, and ultimately change the logic of the economy itself. But we have on our side the fact that people already yearn for something different. According to recent consumer research, 70% of people in middle- and high-income countries believe overconsumption is putting our planet and society at risk. A similar majority also believe we should strive to buy and own less, and that doing so would not compromise our happiness. This is not surprising. Nobody wants to live in an economy that is so obviously programmed to ruin the planet we call home. It makes us feel horrible. Importantly, there is a massive literature in happiness economics, anthropology and social psychology that finds that people have much more nuanced visions of the good life than the old homo economicus model would suggest: that they aspire to good health, intimate relationships, community, knowledge, and time, and are motivated by autonomy, mastery and purpose rather than monetary reward. We need only appeal to the better angels of our nature. 2. Democracy is the answer. Branko articulates a common worry: that the only way to degrow an economy is to have some kind of authoritarian dictatorship do it for us. I completely disagree. Imagine: what if we had an open, democratic conversation about what kind of economy we really want? What would the economy look like? What kinds of objectives would it have? How would it distribute resources? The evidence I've cited above leads me to believe it wouldn’t be anything like our current system, with its tyrannical obsession with endless GDP growth and pro-rich resource distribution. We have never had this conversation on a mass scale, because (a) our media is controlled by a small number of mega-corporations that are structurally disinclined to facilitate such a conversation; and (b) we do not live in real democracies. As a recent study pointed out, the United States resembles an oligarchy with the policy preferences of elites routinely overriding those of the majority. The same is likely true in every nation where money buys political outcomes. So, as George Monbiot put it in an elegant proposal on Viewsnight recently, kick big money out of politics, dismantle the media conglomerates, and let’s have a real discussion about the economy. Our vision of a different economy does not require totalitarianism. Quite the opposite: it requires the exercise of democracy against the violent tyranny of growth. 3. There is already a movement for change. Branko concludes on a frustrated note, saying, basically: “if you really believe in degrowth, then why don’t you try to make it happen?” He assumes that we are crying out in the wilderness, and that nobody will actually accept what we propose. I’m not so pessimistic. But let me be clear: is there widespread public support for de-growth? Not yet. And that's hardly surprising: as I have been at pains to point out, degrowth is structurally impossible in our existing economy. So the first step is to change the logic of the economy. And on this front the movement is surging. The US states of Vermont and Maryland have already adopted an alternative to GDP – the Genuine Progress Indicator – and a number of European governments are considering the same. Key economists like Stiglitz and Sen support this shift, and it appears as a goal in the SDGs. As for decommoditizing social goods, there is overwhelming popular support for this in most rich nations. About debt: there is the Jubilee campaign, and the anti-debt movement among US students, and virtually everyone in Greece. And on fractional reserve banking there is Positive Money, and the Chicago Plan promoted in a recent IMF report. A carbon tax would be a key step – something that Branko himself supports, along with a growing chorus of others, as a way of internalizing costs. I bet getting rid of the $5.3 trillion fossil fuel subsidy would be popular too (look at the divestment movement for proof of mass resistance to fossil fuels). As for redistribution as a substitute for growth: is there momentum there? Just look at Occupy, the Bernie campaign, the Corbyn Labour Party – or talk to any person on the street. Speaking of Labour, Dr Dan O’Neill, a prominent degrowth economist, was invited to write a policy brief that the Labour Party has publicized, highlighting a number of sensible objectives, including limits on resource use and waste production, and a shorter working week. These ideas were unthinkable even a decade ago. Now they are shooting into Europe’s biggest political party – and finding concrete expression all over the place, from the local food movement and Transition Towns to alternative currencies and regenerative farming. This is just a small fraction of what’s out there. We are already building the new economy. Nearly everyone I meet is inspired by this – and students and young people rally around it with energy and passion. Still, we have a lot of work to do. I hope that Branko will join us. Our demands are not “absurd”, as Branko claims. What is absurd is to believe we can continue with the status quo, against the rising tide (literally) of evidence to the contrary. Fortunately, we have one thing in our favor: while it may not be possible to change the laws of physics, it is possible to change social and economic systems – we have done it many times in the past, and we will do it again. We have to. I bet any actual migrant would object. As someone who has spent years living with migrants and researching migration, I know I do. They’re not risking their lives because they want to buy more stuff, but because they want to survive, and – if luck is on their side – live a decent life. Many risk the journey because they’ve been displaced by violent military intervention in the service of Western capital, or in order to flee the ravages of climate change in their home countries. It is coercion, not choice. If we zoom out, it becomes clear that these refugees are in many cases victims of Western over-consumption and excess growth, not disciples of it. They are a living, breathing reason for why we need to change the system. Let me finish by clarifying one key point. On a couple of occasions Branko has tweeted his dismay that we simultaneously call for degrowth while also calling for the end of austerity. But this is not a contradiction. Think about it: the whole point of austerity is to slash public goods in order to re-start economic growth, with devastating consequences for the poor. Austerity is a violent expression of our system’s need for endless growth. In this sense, de-growth is the exact opposite of austerity. It calls for redistribution (in support of public goods, for example) in order to render growth unnecessary. It names the violence of the growth imperative and calls for something better. This is exactly the argument that Milanovic articulated during our email exchange. I responded by pointing out some of its problems and by gesturing in the direction of relevant literature he might find useful, but he never replied. Apparently he had made up his mind, and was ready to take a public stance. So let me publicly lay out some thoughts in response. 1. Degrowth does not call for immiseration. Imagine cutting the GDP per capita of the US down to less than half its present size, in real terms. This might sound horrible on the face of it, but it would be equivalent to US GDP per capita in the 1970s. Folks who lived through the 70s remember them as heady days. And the poverty rate was lower back then – and happiness levels higher – than now. Real wages were higher, too. The only difference is that people consumed less unnecessary stuff. It’s not clear why Milanovic considers this to be so dreadful. There are lots of other examples we might cite. The GDP per capita of Europe is 40% lower than that of the US. I live in Europe: it is hardly a dystopia. Costa Rica has a GDP per capita that is one-fifth that of the US, but it has life expectancy that outstrips that of Americans, and levels of happiness that rival those of Scandinavians. All of these examples prove that we don’t need ecology-busting levels of income and consumption to live good lives. The literature is very clear on this: just check out Tim Jackson's Prosperity Without Growth, Schumacher's Small is Beautiful, Firamonti's Well-Being Economy, Raworth's Doughnut Economics, or anything by Giorgos Kallis. 2. In fact, degrowth calls for human flourishing. Proponents of degrowth don’t just want to redistribute income within the already-existing economy, as Milanovic wrongly assumes. We want to redistribute income in a way that improves social goods, like universal healthcare and education, which are key to reducing poverty and improving people’s lives. Not only are universal systems cheaper and more efficient at achieving these outcomes than private ones (healthcare in the UK costs one-third that in the US), but having them in place also improves the "purchasing power" (if you will) of incomes. Think about it: if Americans didn’t have to pay exorbitant prices for healthcare and higher education, they would need a lot less income to live good lives. 3. Degrowth demands a different kind of economy. To be honest, I'm surprised that Milanovic didn’t jump on a more obvious issue, namely, that if our economy stopped growing it would more or less immediately bump up against financial crisis. Why? Because our economy is shot through with debt, and debt comes with interest; and because interest is a compound function, all of us have to run around producing more and more each year, shoveling money into the pockets of the rich, just to pay it down. If we halt the rat race, the whole house of cards will collapse. And it doesn’t help that, given fractional reserve banking, our money system itself is based on debt. 4. Trying to eradicate poverty through growth is going to immiserate everyone. 5. Green growth is not a thing. **NOTE: Milanovic responded to this post insisting that degrowth is not politically feasible. But I disagree: people are ready for a new economy. See my argument here.